Although coyotes for the most part stick to the darker hours, it is not unusual to see one out during the daytime, on park trails, or on the streets. They like grassy fields where they can hunt, and they like woodsy areas where they can take refuge. At times they may pass through our backyards. These are within the range of normal coyote behavior. We might ask, “Don’t they know they should stay in a park and out of sight?” But how could they possibly know OUR boundaries? 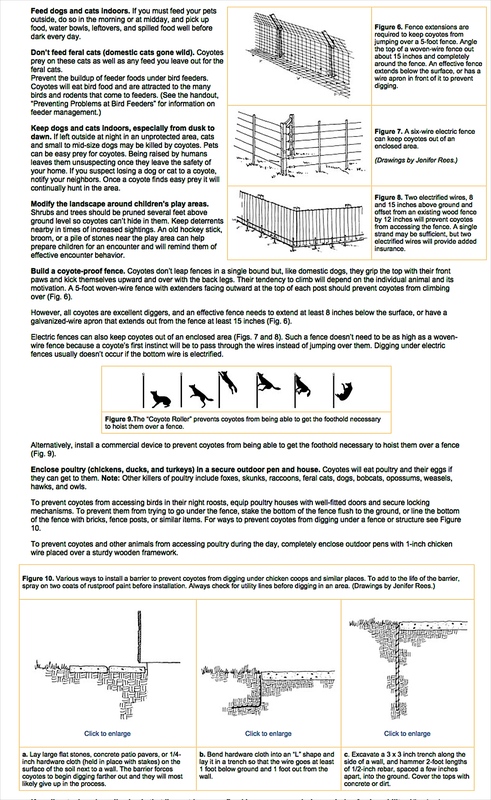 Remember that humans delineate their “boundaries” very differently from coyotes: we use physical and visual boundaries which have meaning for us, such as fences and streets, whereas coyotes use olfactory ones which they create by marking or urinating along their territory’s periphery. Most of the time when you see a coyote, it will be hunting in a field for rats or voles, or just passing through. Most of the time, when a coyote sees you, it will flee or keep far away. If a coyote is minding its own business, we try to leave it alone. Coyotes are known as “opportunistic” eaters — they eat what they happen to find. You will be inviting them into your yard if coyotes find a food source there, such as small pets or pet food. Do not make your beloved pets a part of the food chain. Always supervise small dogs and keep your cats indoors if coyotes are around. Coyotes want to avoid you as much as you want to avoid them. If a coyote comes within 30-50 feet of you, it will most likely be just an unexpected chance encounter. Coyotes are curious and may stop to observe. This is not an act of aggression. You can avoid the coyote by turning and going in the other direction. However, if you want to trudge on in the coyote’s direction, which we don’t recommend, you may try yelling or stamping your foot as you approach the coyote — this may work with some coyotes. Tossing a small stone in the coyote’s direction — not AT it so as to injure it — may also cause the coyote to distance itself. If the coyote ignores you and holds its ground, it could indicate pups are around — in this case, just leave without forcing a confrontation. If a coyote comes to your yard, if you want to scare it off, simply open the door, bang pots, while walking in the coyote’s direction. A dog walker’s first line of safety in dealing with a coyote should always be vigilance and awareness. Leashing in a coyote area is your primary tool for controlling your dog and keeping it away from coyotes. Then, whether a coyote has been spotted in the distance, is approaching, or suddenly appears right next to you, the *first line of action* should always be total and absolute, unmitigated avoidance — not hazing, which is engagement. Tighten your leash and walk away from the coyote, keeping your eye on it may keep the coyote from approaching further. This is an easy protocol to follow, especially for dog-walkers with little or no coyote knowledge or experience, and those who are fearful of coyotes. Simply get your dog away from that coyote — disengage and move away: Strict Avoidance. It’s really not practical or fair to ask elderly people or those who are afraid of coyotes to “haze”/harass them. Walking away — without running — accomplishes what is needed: the coyote’s entire intention in approaching is to move you away. So, do it! Vulnerable smaller dogs which might be viewed as prey should be picked up immediately. The coyote may end up following you for a little ways as you walk away, but as you distance yourself from its area, he will soon lose interest. It is especially important not to confront a coyote when pups are around because, like all parents, the coyote will defend its young against your dog. Prevention is the best policy. Once your dog and a coyote have engaged, try pulling your dog away and keep walking away. Scare tactics — such as making eye-contact, lunging at (without getting close), clapping and shouting aggressively at a coyote — do not always work. It’s best to practice prevention proactively than to reactively have to scare off a coyote who comes too close. Always be VIGILANT and AWARE when you are out walking your pet. AVOID, AVOID, AVOID, whether you see a coyote far away, at a mid-range distance, or coming in close to you, by calmly tightening your leash and walking in the other direction, while keeping your eye on the coyote may discourage the coyote from approaching further. Do not run. Stay calm and collected. Always pick up a small dog and walk away calmly. Footnote: Some Coyote Behaviors to Understand: “Habituation is a process which occurs in all animals whereby, after exposure to anything new in their environment over time, they become *used* to it, be it a smell, sounds, or a visual object, including people — they stop behaving as though these might be dangerous, because they aren’t. They learn that we are not their predators or competitors. By the same token, coyotes also get used to hazing — they get used to it — which is why it often does not work. Conditioning is a learning procedure involving association. Food is a primary conditioning agent. If you leave food out regularly, you will be conditioning or teaching, through rewarding with food, a coyote to come visiting. Hand-fed coyotes have been trained to approach people. This is why we ask folks please never to feed a coyote! 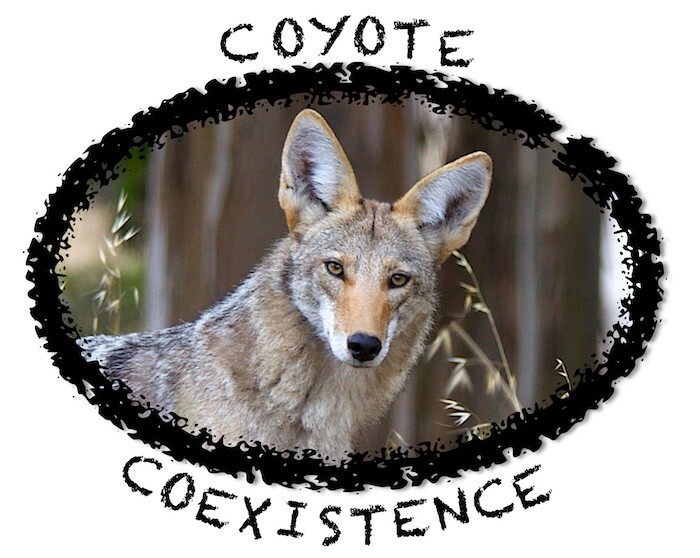 On another note: Excessive LOVE for a coyote — be it through feeding, befriending, trying to get near, attempting to communicate, or even prolonged mutual visual contact, even if the coyote appears amenable — can break down natural and healthy safety barriers. Instead, try loving their wildness — at a distance! This entry was tagged coyote coexistence, coyote hazing guidelines, coyotes, hazing, hazing a coyote, how to haze a coyote. Bookmark the permalink.